This is the tale of how the dashing Prince met and fell in love with the beautiful American actress. Despite their differing backgrounds and career paths, the royal couple are united in their commitment to charitable campaigns and devotion to one another. Pitkin is delighted to p... read full description below. Since the announcement from Kensington Palace that Harry and Meghan had chosen St George's Chapel on 19 May, 2018 as their wedding venue, the world has been gripped by wedding fever. 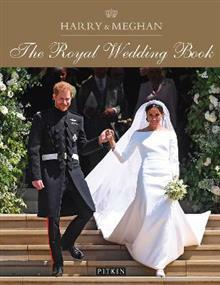 Pitkin is delighted to publish this new royal souvenir in commemoration of their special day. This is the tale of how the dashing Prince Harry fell in love with and married the beautiful American actress Meghan. It is the celebration of a truly modern love story. This book explores their early years, how Harry and Meghan met, and how love culminated in one of the most anticipated weddings the world has ever witnessed. Born on 15 September 1984, Harry, christened Henry Charles Albert David, is the second child of Prince Charles and Princess Diana and younger brother to Prince William. Harry is the fourth grandchild of the Queen and Prince Philip and currently fifth in line to the British throne. His bride Rachel Meghan Markle, known simply as Meghan, was born on 4 August 1981 and grew up in Los Angeles, California. She is the daughter of Thomas Markle, an Emmy award-winning lighting director of Irish and Dutch descent, and Doria Ragland, an African American psychotherapist and yoga teacher. As an accomplished actress, Meghan fulfilled her childhood dream of being a television star. Meghan has now become one of the senior members of the royal family. With her American nationality and her identity as a mixed-race woman, Meghan introduces something new into the royal family, something that has been described as a `breath of fresh air' that will assist the monarchy in its move towards modernity. With her Prince at her side, we have seen how Meghan has embraced her new role with natural charm and elegance. Despite their differing backgrounds and career paths, the new royal couple are united in their commitment to charitable campaigns and devotion to one another. Their wedding is a reflection of their love and hopes for their future life together. Halima Sadat is an expert author and editor with a wealth of experience in journalism and biography. She has worked for Trinity Mirror and award-winning magazine Horse&Rider. Since joining the Pitkin heritage team, Halima has turned her focus to the Royal Collection series, writing Harry & Meghan: A Royal Engagement and our celebratory biographies due for publication in 2018:The Queen and Her Family, William: Duke of Cambridge and Catherine: Duchess of Cambridge.